Instant Card & Hard Copy Card with Every Purchase. Training Adheres To AHA Guidelines. 100% Online. No Live Skills Test Required. 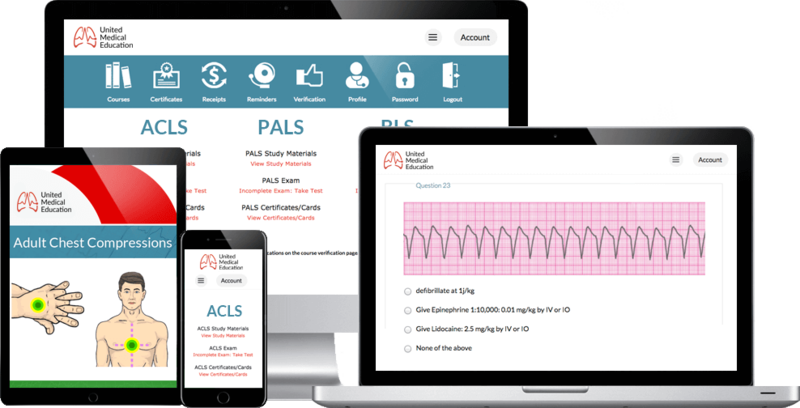 We provide the fastest classes and provider card delivery for ACLS certification online (Advanced Cardiac Life Support), PALS (Pediatric Advanced Life Support), and BLS (Basic Life Support). Our students are able to certify in under 60 minutes. 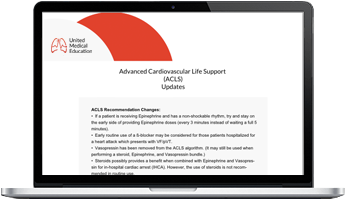 The ACLS online classes, training materials, and exams are always available through your student account. Our automated system eliminates any waiting period as you complete your courses. From registration to certificate delivery, our online courses are the fastest in the industry. Even if it is your first time taking the class or you’re working on renewal, you can complete the training at a record pace. Our courses are certified for AMA PRA Category 1 Credit™ and ANCC credit hours in joint providership between United Medical Education and Postgraduate Institute for Medicine. Regardless if you are certifying for the first time or working towards provider card renewal, there is no time limit on the exams. Also, you may take the final exams as many times as you need to pass without penalty. You will also receive instant test results after exam completion. With successful exam completion comes your free instant digital provider card so you won’t have to wait for the hard copy card to come through the mail. Our training and instructional materials are included in the single original price of the course. Our students receive everything they need to successfully complete their exam fast and without the headache of hidden fees. We follow the most current guidelines of the AHA. The manuals and algorithms can be reviewed over the Internet or can be printed for your convenience 24/7. GET YOUR PROVIDER CARD TODAY! Don’t miss work or school because of provider card expiration. We have completely eliminated any wait period by giving you instant exam results and an instant digital provider card. The instant digital card uses the same image template as our hard-copy card making it identical in every way. Here at United Medial Education it is our goal to meet the needs of all of our students. We stand by our training and are proud to offer a 100% money back guarantee to students who are unsatisfied with their class and want to take advantage of the risk free trial period. Don’t feel rushed to complete your training. There is no expiration to your training and exams. You can purchase all three classes and complete them at your own convenience. Once you have completed your class, the provider card and certificate are valid for two full years. 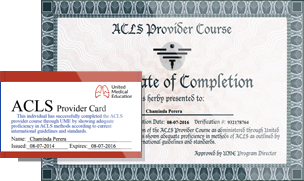 ACLS certification online (Advanced Cardiac Life Support) can easily be earned in under 60 minutes. We believe here at United Medical Education that learning doesn’t have to be difficult. Free instructional materials, ACLS pretests, a final exam, an instant digital provider card, and a hard-copy card are given to every student that orders the class. The course follows the most current AHA guidelines and standards. PALS certification online (Pediatric Advanced Life Support ) teaches advanced life saving methods. This specific class focuses primarily on the successful resuscitation and life saving techniques for the pediatric population. Appropriate parameters and vital signs are included to help the student understand what vital signs are normal for the age of the patient and what vital signs should be treated. BLS certification online (Basic Life Support) can be completed from start to finish in under an hour. The BLS training will teach you everything you need to know to maintain sufficient circulation to your patient’s vital organs until further life saving interventions can be implemented. There is no need to rush or stress about completing your courses. There is no time limit set to your instruction. Your classes will never expire. After signing up you will have access to your account any time, day or night. Even after successful exam completion you will continue to have access to the training materials and updates. Here at United Medical Education you can take your final exam knowing that you are well prepared. We provide ACLS, PALS, and BLS pretests to help students know what to expect from the final exams. The grading of the pretests is automated and will let you know which questions you answered correctly and incorrectly. After completing your class you will receive a hard copy version of your provider card by mail. Standard US shipping is provided for free with registration. Provider cards are shipped daily and will arrive shortly after exam completion. Our provider cards are indistinguishable from those given for a live class. On each of your provider cards is printed your home city as the course location and a signature of a regional instructor. Although it is ultimately your employers decision to accept or reject your provider cards we are proud to say that our classes have over a 98% acceptance rate both nationally and internationally when presented to an employer or school.